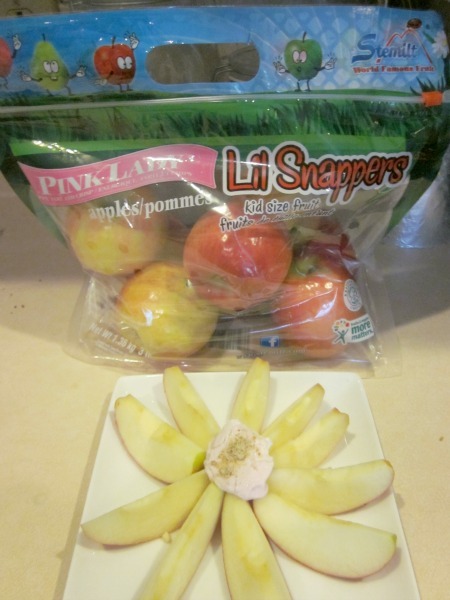 Lil Snappers has some kid friendly, creative, fruit recipes that you can make with your child. I looked through the Lil Snappers Website and found lots of great ideas for healthy fruit snacks to make in fun shapes for my kiddos and I decided to try a few out as after school snacks. My kids already enjoy fruit but they really loved the recipes because they were so cute. This recipe was easy to make, needed only a few ingredients but came out so cute. I think I will use it for my son’s birthday party that is coming up. 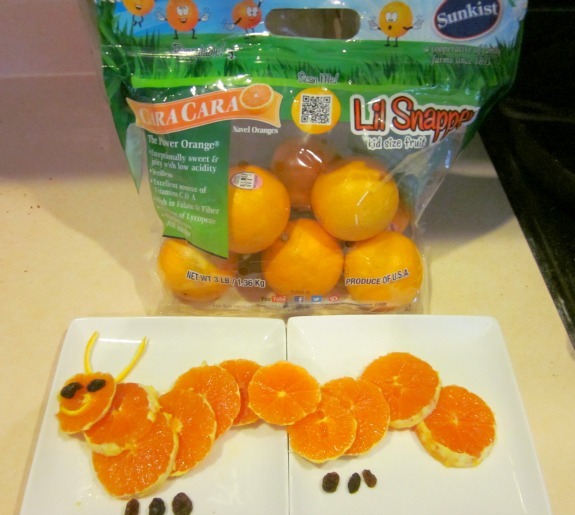 You just slice up the Lil Snapper Cara Cara Navel Oranges which are the perfect size, arrange them, add raisins for feet and eyes, and orange peel for antenna and voila- an orange masterpiece! This recipe was also super simple. I just sliced up my Lil Snapper Pink Lady Apples, arranged them like a flower, added a dallop of yogurt in the middle and I sprinkled mine with some almond meal as “pollen” but you could use chopped nuts, granola, or flax seed too. My kids have requested this snack 3 times this week! If you like these healthy fruit snack ideas, you should check out the Lil Snapper Recipes page for even more great ideas. Lil Snappers are kid-sized fruits. They are just the right size for me to include the whole fruit in my kids’ lunchboxes which makes it easy for me with no cutting or packaging. Pink Lady Apples- These originally came from Australia. They are the very last variety that Stemilt Growers harvests in Washington State each year and they are available at stores from November through July. Cara Cara Navel Oranges- These look like a small, regular Navel orange on the outside, but on the inside they are darker and almost red or pink in hue. It is nicknamed ‘The Power Orange®’ because it packs a nutritional punch with more Vitamin A and C than normal oranges! They are incredibly sweet and delicious. These are in stores from December through May. If they are not at your local store, you can always talk to the produce manager and request that they stock Lil Snappers. I participated in a campaign on behalf of Mom Central Consulting for Lil Snappers. I received product samples to facilitate my review as well as a promotional item as a thank-you for participating.